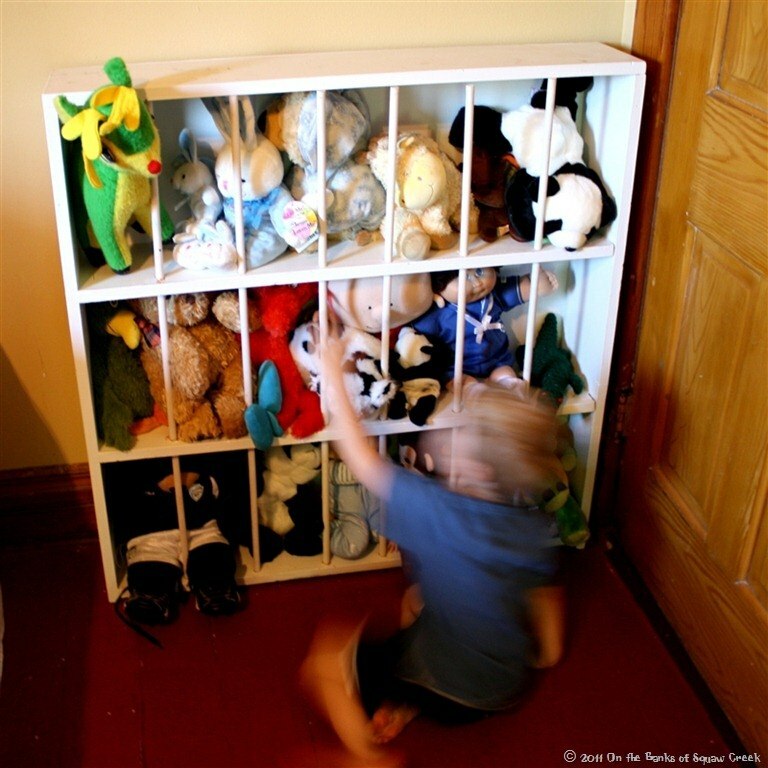 ​Stuffed toy collections are one of those things that grows exponentially as your kids grow. Before you know it, all their teddy bears and cute puppies are taking over your home. 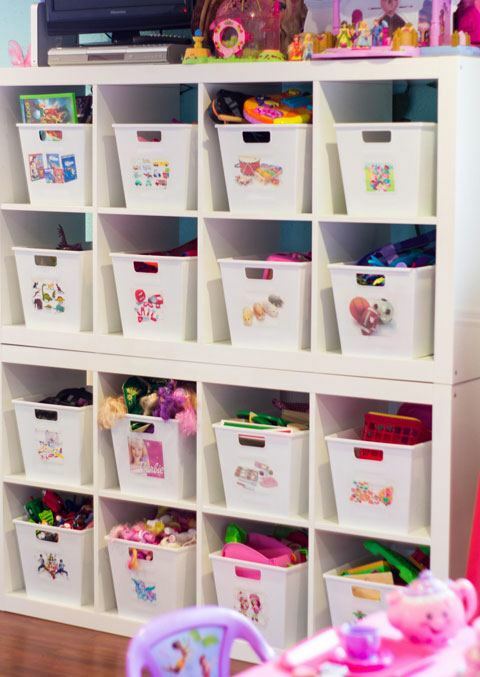 You're definitely not alone - I think every parent comes to the 'stuffed storage dilemma​' at some point. ​So we're here to offer the solution (for every situation). Whether you're looking for someone quick, cheap, and easy. Or maybe you want to put on your designer hat and construct a super-cool storage unit. We got y​ou! I tried to make sure everything on this list has some decent instructions, pics, or videos so I don't leave you hanging. And don't forget to share your ideas/solutions in the comments! 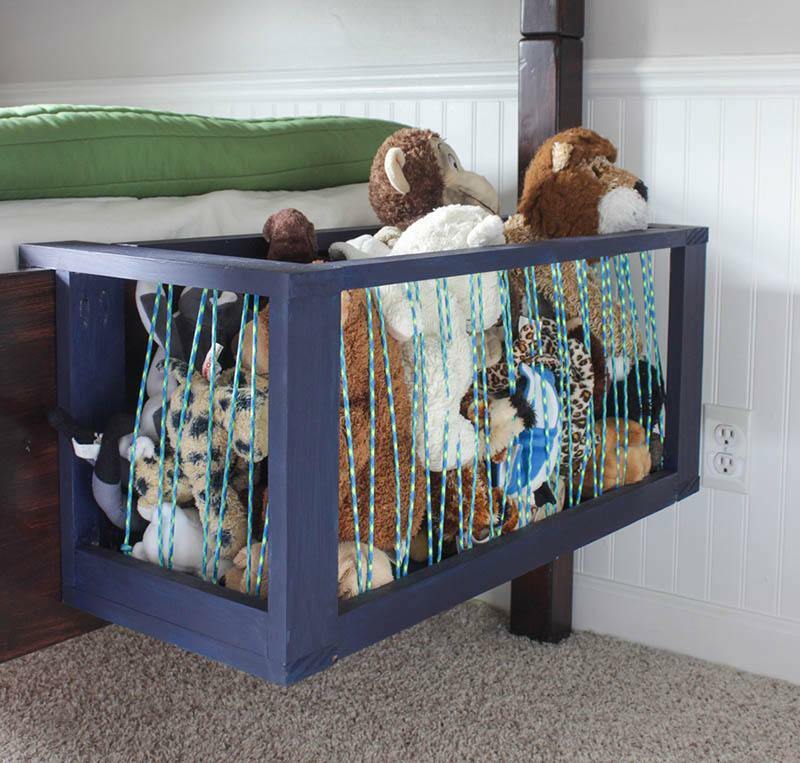 ​This ​awesome toy box actually hangs off the side of the bed frame (notice the hooks on the end?). 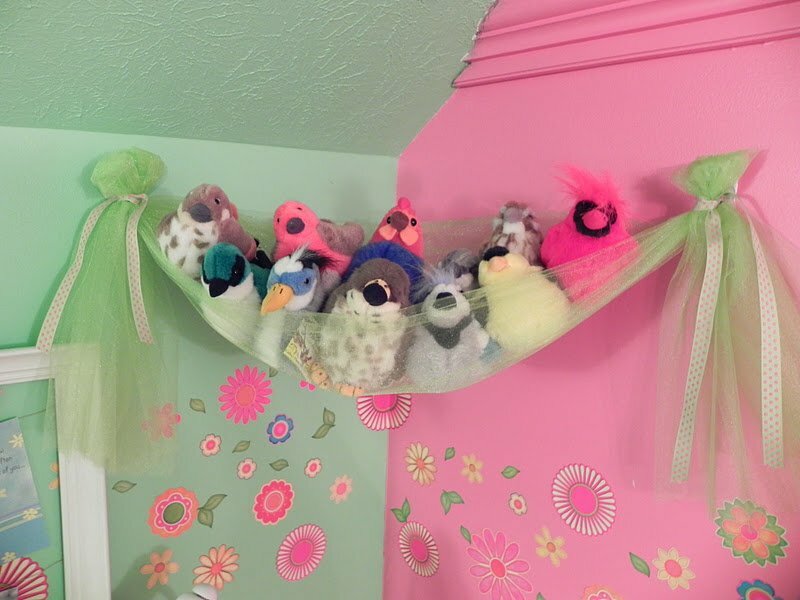 And the flexible bungee cords are perfect for overstuffing with all your favorite animals. 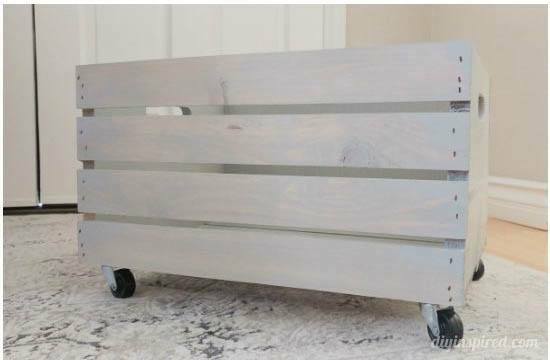 Mind you, you'll need a strong bed frame to hang this off of, but you could ​use it as a simple floor unit. ​Not only is this practical, but rustic and beautiful. 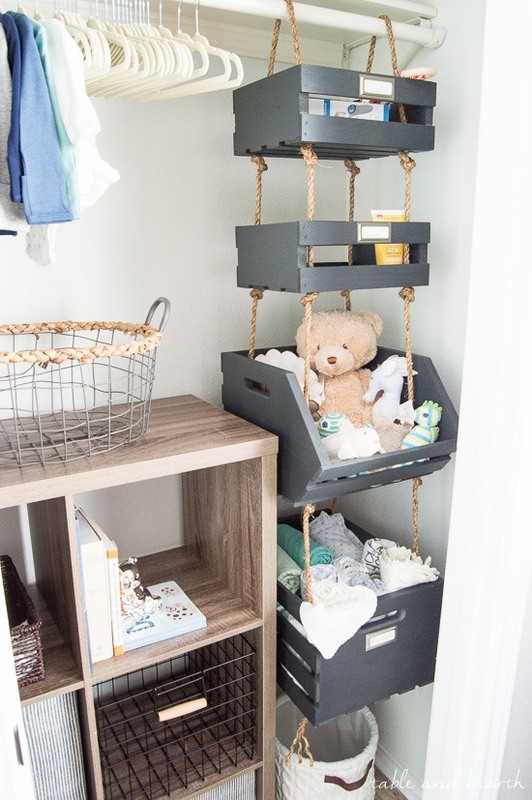 Plus I like multi-use projects like this, where it can be used to store stuffed animals, toys, art supplies, or anything else for that matter. 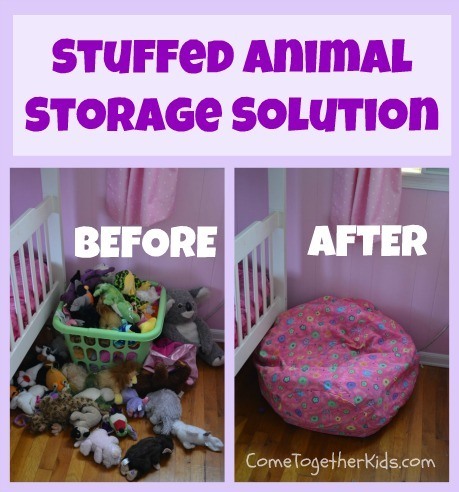 That being said: this particular project may not be good for large stuffed animals, but you could combine ideas from this list to make it work (like using some of the shelf space with bungee cords instead of buckets). 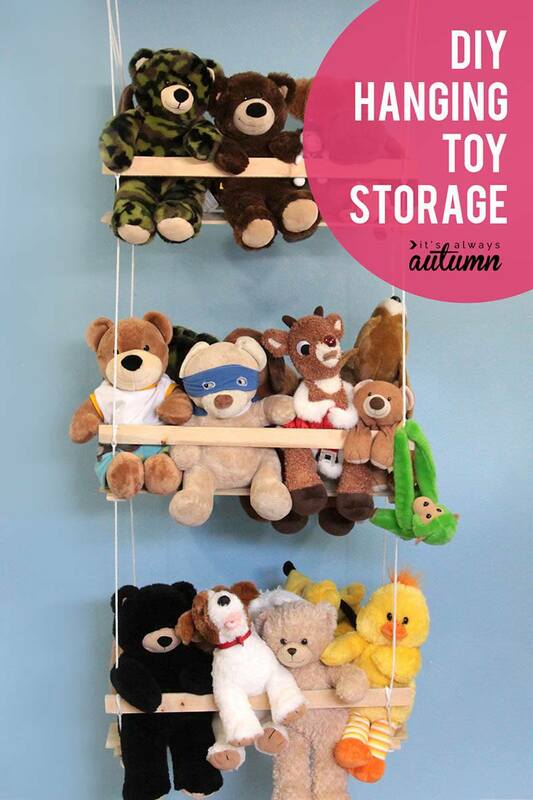 ​If you've been searching for ​stuffed animal storage around the interwebs then I'm sure you've come across this project. And that's for good reason. 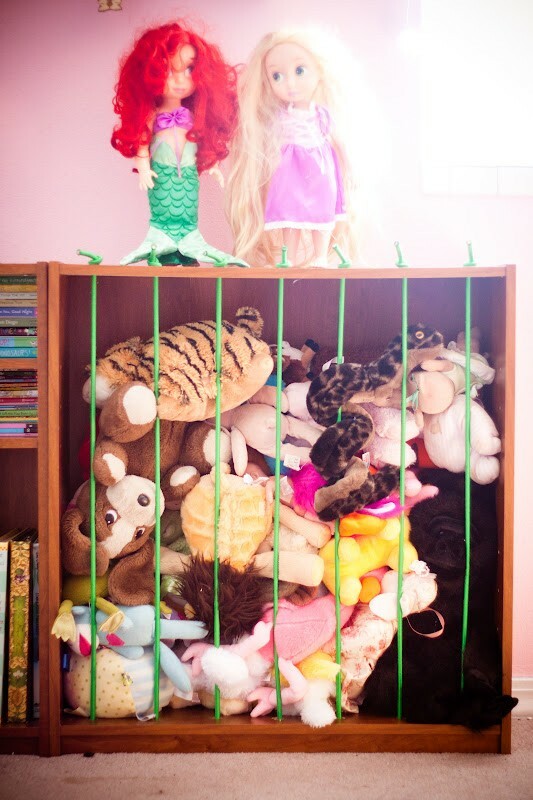 The corner cage is fantastic for those with a huge collection and need dire need of a space saving solution. 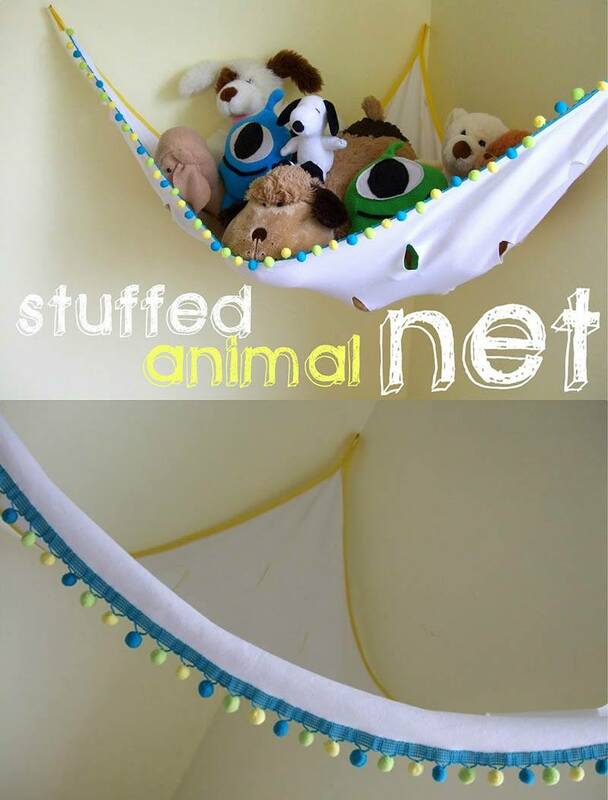 ​If you're looking for something a little more elegant and has some wonderful presentation points - an animal net might be ​perfect. Projects like this allow you to find your creative side, you can pick a fabric or trim to suit the theme of ​any bedroom. ​Here's one of those things that'll make you say: "Why didn't I think of that?" It's really ingenious, just use a shelf you have around the house (or pick up a cheap one from Goodwill or Ikea), drill a few holes and tie some bungee cords through it. ​This is as simple as it gets, just buy a wire laundry basket like this and call it a day. The large space between the wires allow you to sneak out the stuffy that you need. ​Bet you wouldn't have guessed these are hat boxes? That's right - almost all of the work is done for you. 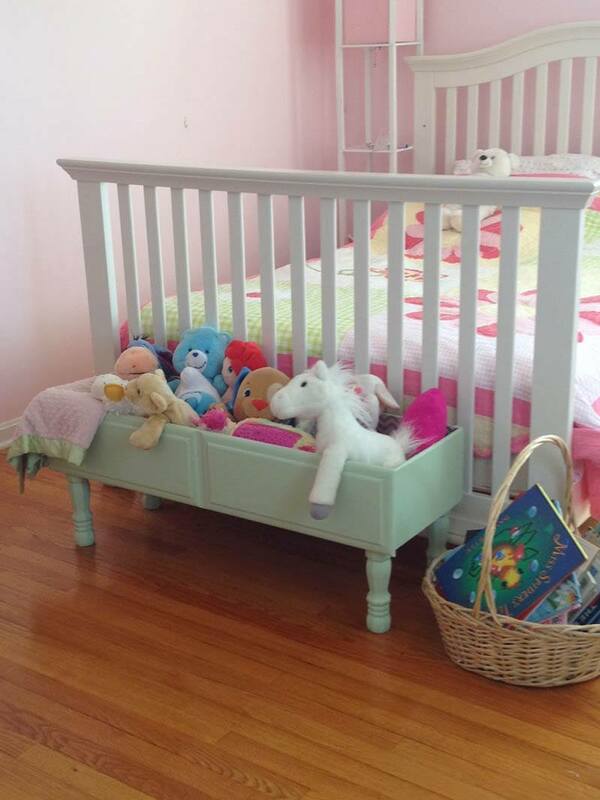 You'll just need a hammer and nails to pin them up, and maybe a little paint to ​create some different colors. 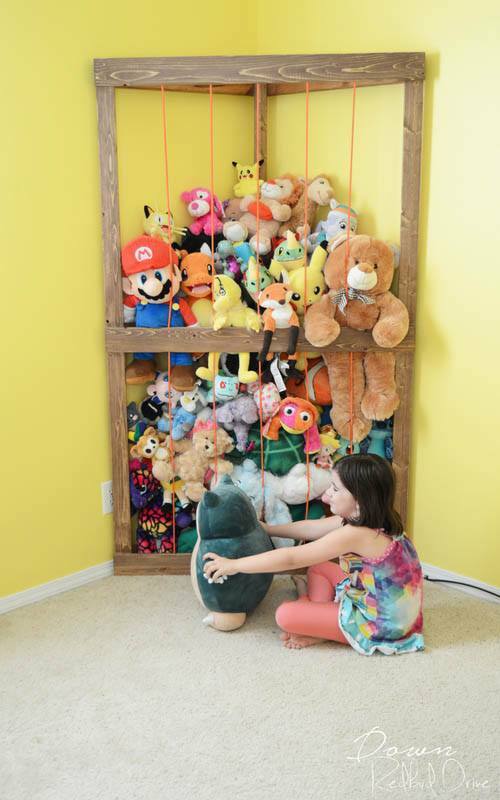 ​Maybe not ideal for a huge collection of stuffed animals, but it's still super cool and would fit into any bedroom. And of course you can adjust the size of the crates to ​accommodate​the space needed. ​So this is just two Ikea shelves stacked on top of each other (Kallax shelves to be specific). Then each space is given a themed bucket. Seems pretty simple, if you're good at assembling Ikea furniture that is. 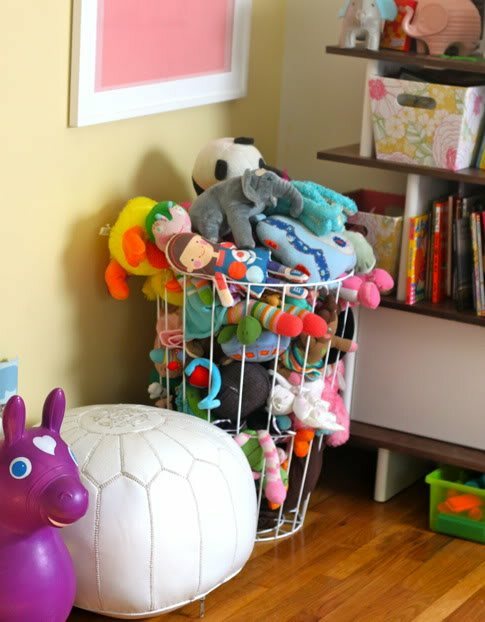 ​This cute little swing set is perfect for adding a little decor to your kids bedrooms while also finding a way to hand some stuffed friends. ​Wheels! You'd be surprised how useful those things can be. Especially when cleaning up after a good play session. And if you're not feeling ambitious enough to construct your own crate you may be able to find a pre-made one at Michaels. 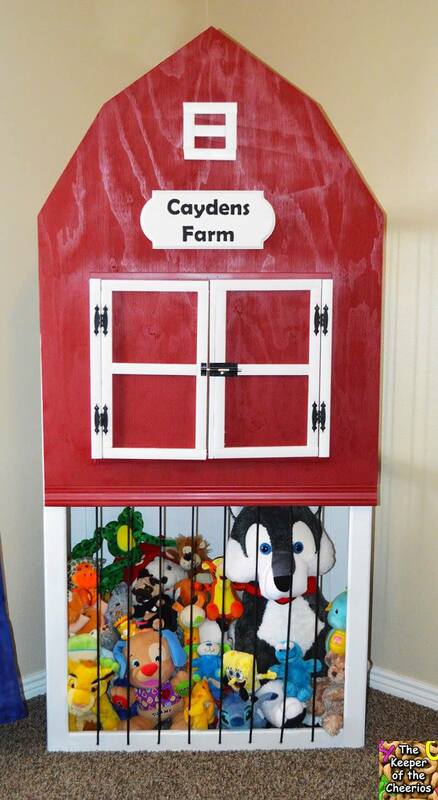 ​I love old farmhouse style furniture, and here's a creative little project to hold some of those extra toys. 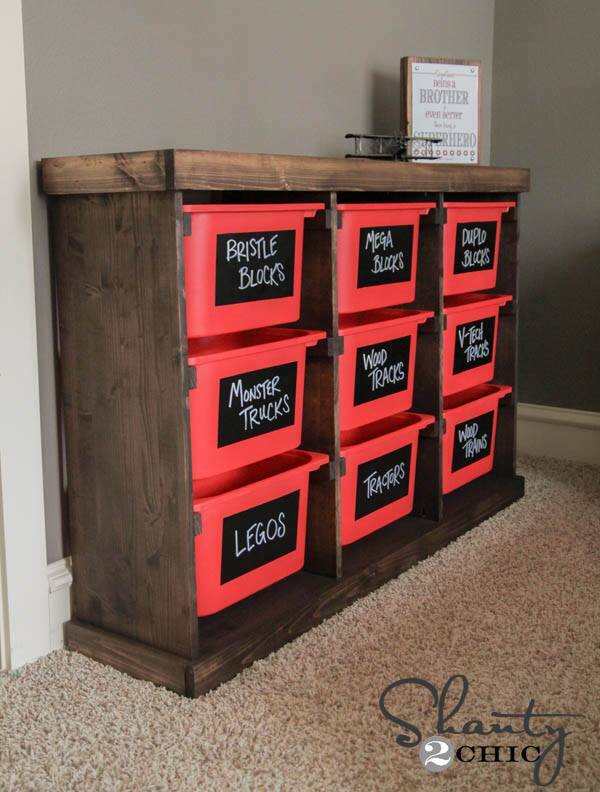 This actually makes use of an old dresser drawer, with a little bit of paint. ​Those things on the wall? Wall planters (you know, for hanging plants on your wall). 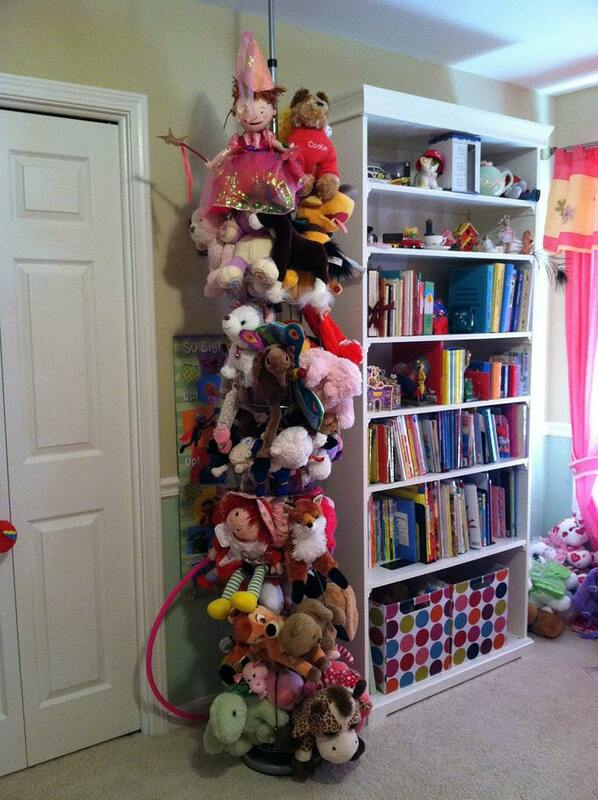 But they're actually perfect for hanging up stuffed animals! How awesome is that? And no to mention super easy. ​The Zoo Project (and I don't mean your home) is a surprisingly simple project. If you have a drill and a spare shelf, all it requires is a few holes and some wooden dowels you can purchase from a hardware store. Now you have your very own monkey cage. ​Every fairy tale princess needs to have birds to sing with, so an elegant bird nest is perfect for the bedroom. The cute bows on each side just made this the best thing ever. ​This is a beautiful piece, and something your kids can hang onto forever because it​ never grows old or out of fashion. You'll need some carpentry skills and a few tools for this one though. ​If you hadn't noticed I'm a big fan of antique pieces with some rustic charm. 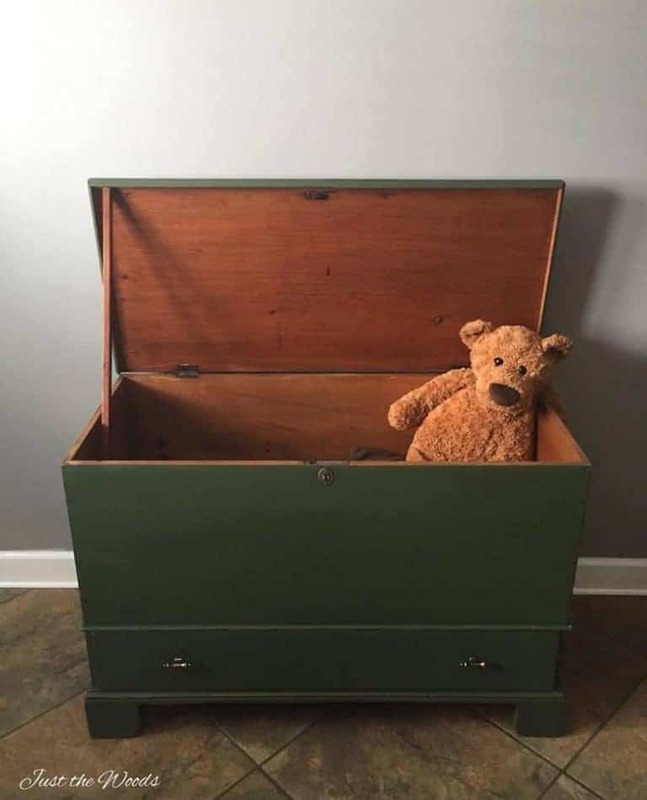 This old chest would be perfect for growing up with - it starts as a toy box but can move around your home for all sorts of useful storage. ​Out of sight out of mind. Stuff all those loose toys into a giant zipper bag and forget about it, or, sit on it. It's a beanbag chair but without the beans, and it's wonderful. ​Feeling extra ambitious? This is a more ​involved project but an absolute masterpiece. 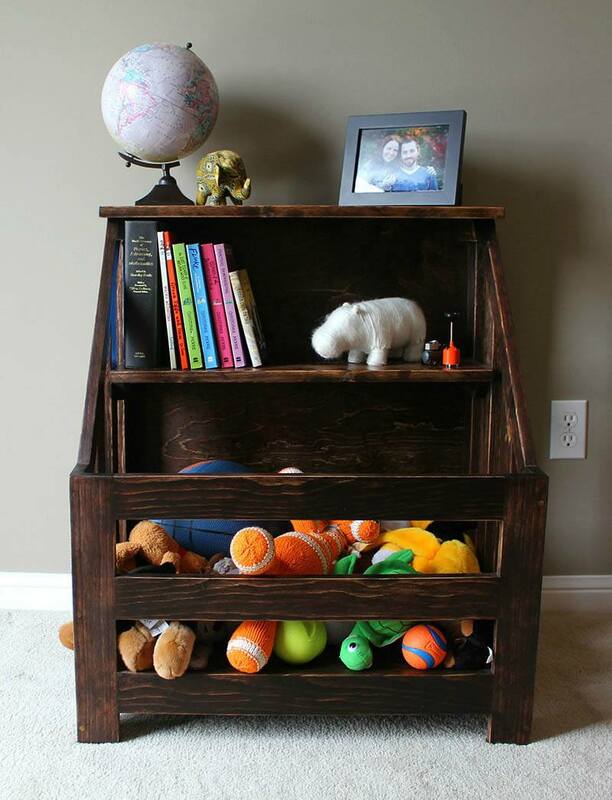 If you're up for a little more of a challenge, or you want something to impress all the other kids in the neighborhood with your master skills, this is the storage zoo for you. 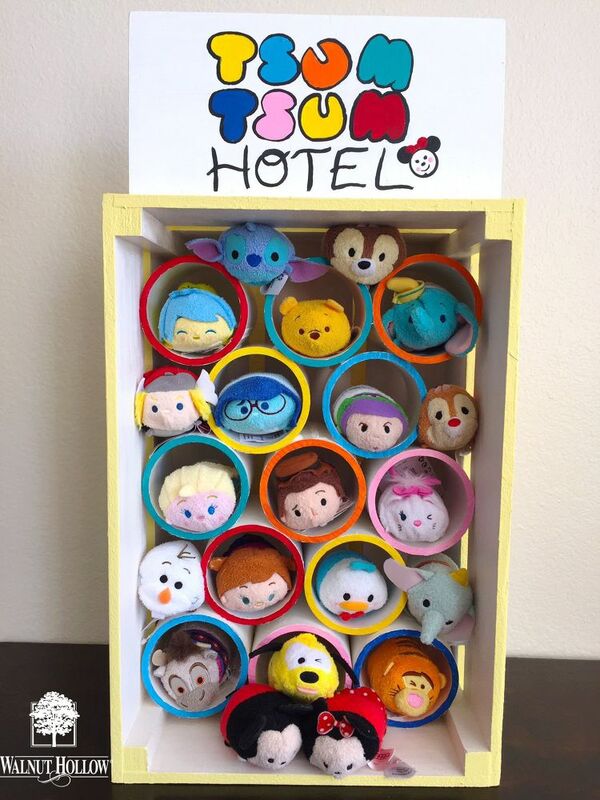 ​This cute little box makes clever use of PVC pipes to store each little stuffy. This would have been absolutely perfect in the Beanie Baby days​, which probably means I'm getting old. ​Saving the best for last - this is the ultimate way to save space. I know because I had ​something similar ​as a kid. It's actually a "shoe tree", and it's designed to be like a coat hanger but for all your shoes. However, use that and some bungee cords and you now have a Zoo Tree.